NEW YORK, NY, May 13, 2013 – With those in attendance underscoring the breadth and depth of a remarkable career in music, family and friends of multiple GRAMMY® Award-winning music producer Phil Ramone came together on May 11, 2013, to celebrate and honor his singularly amazing life. Ramone, who passed away on March 30, 2013, was most noted as an inspired record producer, crafting recordings that have sold into the hundreds of millions of copies for artists including Billy Joel, Barbra Streisand, Frank Sinatra, Tony Bennett, Natalie Cole, Paul McCartney, Paul Simon, James Taylor and many others. But Ramone, a classical violin prodigy who studied at the Juilliard School, was as deeply interested and gifted in the technology of music production, and it’s telling that in addition to his 14 GRAMMY Awards (out of 33 nominations) Ramone was the recipient of a Technical GRAMMY, for his many contributions to the science and art of recording. Such contributions include the establishment of A&R Recording, the Manhattan studio Ramone co-founded in 1958 that set the bar for the industry nationally; his production of Billy Joel’s 1982 52nd Street LP, the first CD album ever commercially released; the Frank Sinatra Duets series of recordings, with which Ramone pioneered recording techniques in which vocalists – in some cases thousands of miles apart – were paired in the studio via fiber-optic technology; and countless more. An early advocate of digital music technology, Ramone also founded one of the first record labels focused on digital music, N2K Encoded Music. The event, titled Phil Ramone, Music Memorial Celebration, was held at the Centennial Memorial Temple, a landmark Art Deco auditorium inside the Salvation Army’s Greater New York Division Headquarters. The choice of venue held a particularly special meaning, since in November 2011 Ramone founded The Salvation Army Phil Ramone Orchestra for Children — the result of Phil’s lifelong dream to touch the lives of less fortunate children in challenged communities by giving them access to music education. The program currently serves children ages 7 to 12, and teaches these students how to play instruments through group and full orchestra lessons. The event read like a Who’s-Who in the music industry. It drew a stream of luminaries who recalled Ramone’s gifts as a person and music professional, including Tony Bennett, engineer Ed Cherney (Bonnie Raitt, the Rolling Stones), Josh Groban, Dave Grusin, Billy Joel, Quincy Jones, Shelby Lynne, Matthew Morrison, Paul Simon, Kevin Spacey, Noel Paul Stookey, Nikki Yanofsky and Peter Yarrow. In attendance were family members Karen, BJ, Matt and Simon Ramone, who shared the stage and the love everyone felt for Ramone. An all-star backup band accompanied many of the artists who performed and included such renowned musicians as Rob Mounsey (musical director/piano), Steve Gadd (drums), Bashiri Johnson (percussion), Ben Butler (guitar), Henry Hey (keyboards), Zev Katz (bass), Vaneese Thomas (background vocals) and Jill Dell’Abate (background vocals and music coordinator). After a performance of “When the Saints Come Marching In” by The Salvation Army Phil Ramone Orchestra for Children, some of the attending artists performed songs paying tribute to Ramone. 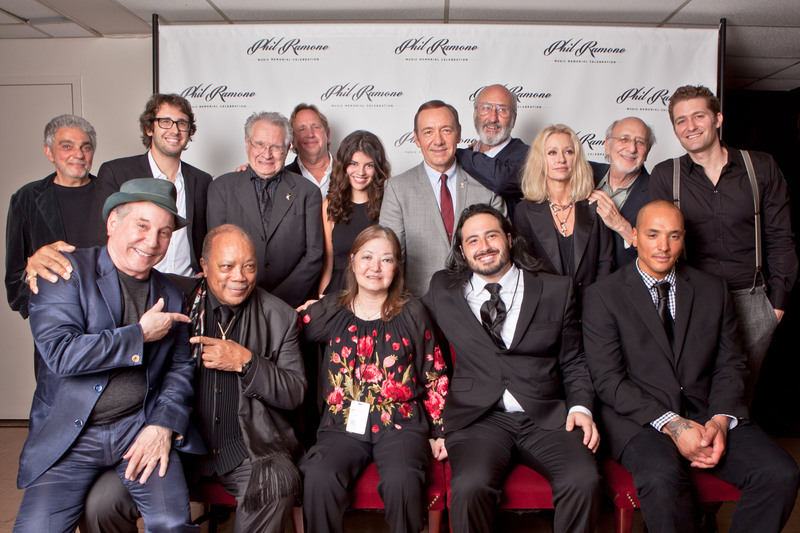 Billy Joel performed “Where’s the Orchestra”; Tony Bennett sang “Fly Me To The Moon”; keyboardist/composer Dave Grusin performed “Sun Song”; Peter Yarrow and Noel Paul Stookey (Peter, Paul and Mary) performed “Day Is Done”; Shelby Lynne performed “You Don’t Have to Say You Love Me”; actor Kevin Spacey evoked memories of Ramone’s work with Sinatra and performed a medley of “By Myself,” ”When Your Lover Has Gone” and “The Curtain Falls”; Nikki Yanofsky performed “You’ll Have to Swing It (Mr. Paganini)”; and Matthew Morrison performed a medley that included “Come Rain Or Come Shine” and ”Basin Street Blues.” Finally, renditions of “Slip Slidin’ Away” and “Fifty Ways to Leave Your Lover” by Paul Simon, and “Smile” by Josh Groban, brought the event to a gentle and wistful conclusion. The 3-hour event was produced by longtime friend and former manager Nancy Munoz (Anami Music, Inc.), who also worked with Phil producing The Songwriters Hall of Fame Awards.